High humidity is always a threat to our health and to the comfort of our home as it is backed up with too many hazards. Humidity can efficiently be controlled with the device called Dehumidifier. 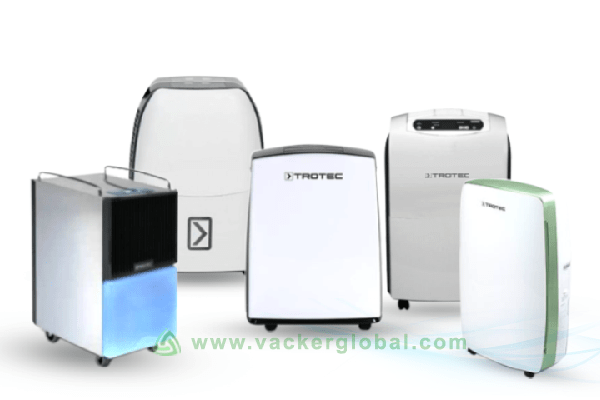 In this article, we will introduce you to the top 5 dehumidifiers supplied by Vacker UAE in Dubai, Abu Dhabi and other emirates of UAE. These top 5 Dehumidifiers will help you to reduce humidity. Before we explain to you the top five dehumidifiers, here is more on the effects of humidity that can cost you. Humidity can directly cause damages to your homes and expensive items like furniture, bags, clothing and so on. Hence, proper humidity should always be maintained. With dehumidifiers, you can stay away from all the hazards and be healthier. TTK 40E is a lightweight dehumidifier with a stylish look and design. It is a portable dehumidifier that can dehumidify the air in the room continuously. With a dehumidification capacity of maximum of 14 liters, this small dehumidifier protects your house from damages caused by the humidity. It occupies a small space in the room and is perfectly suitable for domestic purposes. Enabled with adjustable hygrostat and LCD screen, the user can easily set the desired humidity level with the easy to read functions. The other features of this dehumidifier are that it automatically resets when the desired humidity level exceeds. It is the professional type of Dehumidifier with the high power performance suitable for the dehumidification of large areas. It is equipped with an adjustable hygrostat to ensure that the compressor turns off when you set the desired humidity level. The Dehumidification capacity of the device is maximum of 30 liters per day. Alert lamp indicator for water tank full. The first in the list is TTK 68. It is a sleek and stylish dehumidifier with the green metallic look. It is designed with a unique style which makes it perfectly suitable for your home and office. The Dehumidification capacity of this device is maximum of 40 liters per day. It comes with a hygrostat and is enabled with a timer function and 3 stages adjustable fan. LCD display with easy to use functions. TTK 122E is a dehumidifier which has a high dehumidification capacity of maximum 40 liters per day and performs elegantly well in low ambient temperature. The stylish steel design of this device is suitable for a larger room size. With Automatic Defrost System, this steel-designed dehumidifier has a capacity to work in various applications in frequent changing rough environments. Automatic hot gas defrost system. TTK128E is a smart condensation type dehumidifier is suitable for dehumidification of large rooms and bigger areas as it has a dehumidification performance of maximum of 55 Liters per day. This Dehumidifier can efficiently be used for commercial and industrial purposes. With dehumidifiers, you need not worry about drying clothes and damages to your house. Vacker UAE supplies all types of dehumidifiers for industrial and commercial applications.